With Donald Trump now as Commander-in-Chief, there is new life in longtime neoconservative fantasies of engineering regime change in Iran. Anti-Iran hawks in Washington and Tel Aviv have a rejuvenated sense of power and ability to manipulate the know-nothing jackass in the Oval Office to do their bidding. A rash of commentary penned by the usual suspects and published in the usual hawkish opinion pages of The Washington Post and The Wall Street Journal makes this clear. In the Journal, Mark Dubowitz of the Likud-aligned, Iran-obsessed, and pathetically-named Foundation for the Defense of Democracies likened Iran to a teetering Soviet Union nearing implosion in an oped titled, "Confront Iran the Reagan Way." But Dubowitz knows full well that Iran is not comparable in any conceivable way to the Soviet Union. The analogy is a ruse, merely a way to get around to his real argument: that the United States should ramp up its support for exiled Iranian dissident groups, like the Paris-based MEK, in an effort to overthrow the Iranian government and install a new one more suited to take orders from Washington. Dubowitz has long encouraged military attacks and regime change when it comes to Iran. Writing in the Israeli press back in 2011, Dubowitz argued that "best way" to "end to Iran's nuclear program" was "to work towards changing the regime." 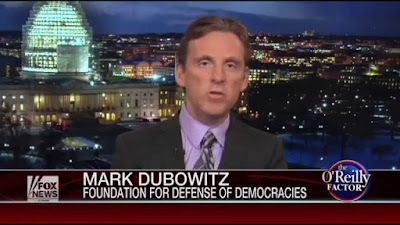 The following year, Dubowitz co-wrote a piece for Bloomberg with fellow FDD Iran hawk Reuel Marc Gerecht, which declared that "if we are going to pursue tougher international sanctions against Iran — and we should — the goal should be regime change in Iran, not stopping proliferation. In fact, regime change would make the idea of an Iranian bomb far more tolerable." But the new push by the likes of Dubowitz and Takeyh might be a different kind of projection, one that actual might gain traction in the Oval Office. Indispensable veteran journalist Jim Lobe explains what's behind the recent neocon gambit. The anti-Iran "hawks, encouraged by Secretary of State Rex Tillerson’s rather offhand statement late last month that Washington favors 'peaceful' regime change in Iran, appear to be trying to influence the internal debate by arguing that this is Trump’s opportunity to be Ronald Reagan," Lobe writes, adding, "Indeed, this comparison is so ahistorical, so ungrounded in anything observable, that it can only be aimed at one person, someone notorious for a lack of curiosity and historical perspective, and a strong attraction to 'fake news' that magnifies his ego and sense of destiny." The target of this Netanyahu-inspired wishful thinking is obvious. And it's not just that the American president is a dullard who is easily influenced and exploited by those whom he seeks to impress, it's that he is also susceptible to this particular fantasy about the frailty of the Iranian government as it has surfaced before in Trump's own bluster. Trump has long claimed Iran had reached the eve of destruction before signing the Joint Comprehensive Plan of Action, the multilateral agreement with six world powers in July 2015 known commonly as the Iran Deal. In May, standing beside Israeli prime minister Benjamin Netanyahu in Jerusalem, Trump ludicrously insisted that, had it not been for the nuclear accord, "I think they would have failed, totally failed within six months." Of course, Iran was nowhere close to collapse before the deal. The talking point is one pushed by neocons, their paymasters, and their shills in Congress, all of whom despise a powerful, stable, independent, non-compliant nation in the Middle East, one that has positive relations with most of the rest of the world and which can actually defend itself against foreign aggression. Soon after Trump’s inauguration, FDD’s CEO, Mark Dubowitz, submitted a seven-page Iran policy memo to Trump’s National Security Council. The memo — which was circulated inside the Trump White House and recently obtained by POLITICO — included a discussion of ways to foment popular unrest with the goal of establishing a “free and democratic” Iran. The term "coerced democratization" is a tip-off as to the coordinated efforts of anti-Iran hawks. The term has appeared in a number of book-length anti-Iran screeds written by Ray Takeyh, one from 2011 and another from as far back as 2006. Dubowitz's adoption and promotion of the term speaks volumes of the neoconservative alignment currently coalescing on K Street and gunning for Tehran.